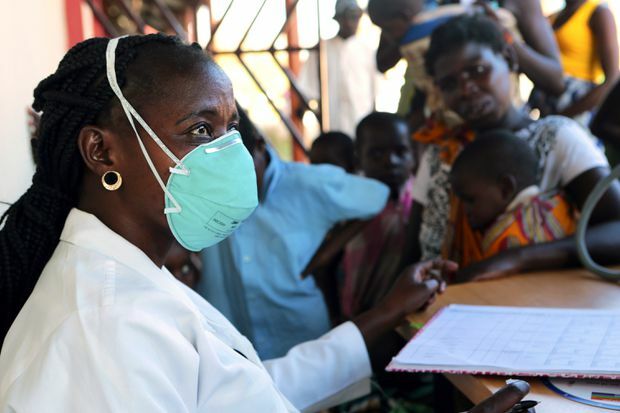 A nurse attends to displaced people suspected of having cholera in a compound in Beira, Mozambique, on March 26, 2019. Some 1.8 million people in Mozambique need urgent help after Cyclone Idai, the United Nations said in an emergency appeal for $282-million for the next three months. Cyclone Idai was “one of the worst weather-related catastrophes in the history of Africa,” UN Secretary-General Antonio Guterres told reporters in New York. He raised the spectre of hunger, saying the storm inundated Mozambique’s breadbasket on the eve of harvest. She said people in camps were living in “horrific conditions” and that about 55 health centres had been severely damaged. The United States said it had donated nearly $3.4-million in emergency food assistance to the World Food Program, whose director was touring Beira on Tuesday.